Hydrophyllum virginianum. Unlike birds, which have an international agency to establish appropriate common names for each species, plants just go with the flow. 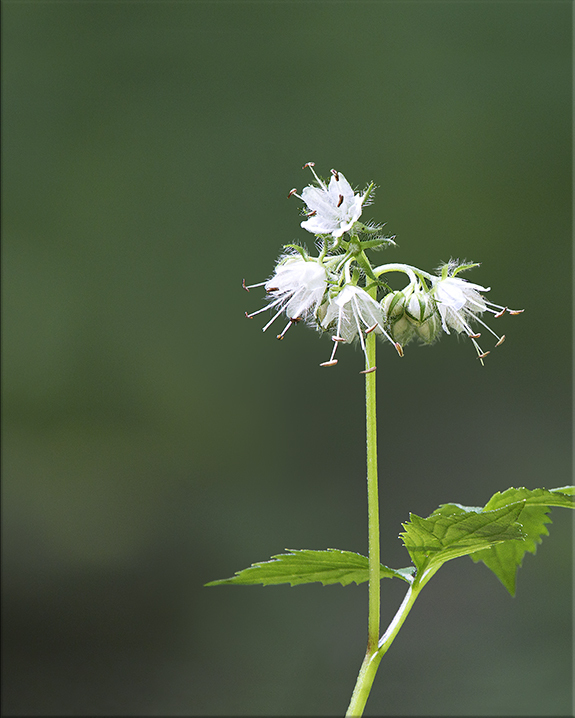 Such is the case with Virginia Waterleaf (Hydrophyllum virginianum), which is also known as Eastern Waterleaf, Shawnee Salad, John’s Cabbage, and a half dozen other folk names. Worse, perhaps, is the fact that no one can seem to settle on the reason for “waterleaf” (which is also the meaning of Hydrophyllum). One explanation is that its large lower leaves are designed to gather in the drip from the trees overhead, keeping the roots well watered. Another is that the type species for this genus has watery leaves. Still another is that the white spots on the leaves look like water stains! Those leaves unfold early in the spring, but it’s not till late spring that the clusters of eight to 20 bell-shaped flowers of white, pink or light purple appear. Various techniques, such as the shape of the flower and positioning of the stamens, are designed to attract and use bees for pollination, while other techniques, such as hairiness of the flowers, discourage smaller nectar-hungry insects. In fact, the waterleaf has an insect virtually all of its own — the Waterleaf Cuckoo Bee. This bee relies on the waterleaf so much that it’s been given the name Nomada hydrophylli. And, no, it’s not cuckoo over waterleaves. Its common name comes from the fact that it practices cleptoparasitism. Like the cuckoo bird that lays its eggs in the nests of other species that wind up raising the cuckoo chicks, the Nomada lay their eggs on the pollen stores in the nests of other bee species. Thus, in effect, the other bees wind up feeding and raising the Nomada babies.